The brutal government of Sri Lanka (GoSL) now admits the abduction of two activists, Premakumar Gunaratnam and Dimuthu Attygalle and has released them. Mr Gunaratnam and Ms Attygalle were abducted on the eve of the formation of a new party – the Frontline Socialist Party. Mr Gunaratnam has been deported back to Australia. Initially the authorities denied any knowledge of their whereabouts. This caused huge anger and sparked protests in Sri Lanka and around the world. For the first time the abduction and persecution was condemned by both Sinhala and Tamil activists in the country. Also for the first time Tamil Diaspora groups expressed their solidarity and support in the protest against the abduction. Amidst the international protest, clearly in fear of uniting the fightback, the government backed down and released those two activists. But still the fate of two other activists who were previously abducted, along with a number of others, and all those Tamils still cruelly held in detention camps, are not known. Despite the release a protest went ahead in London. 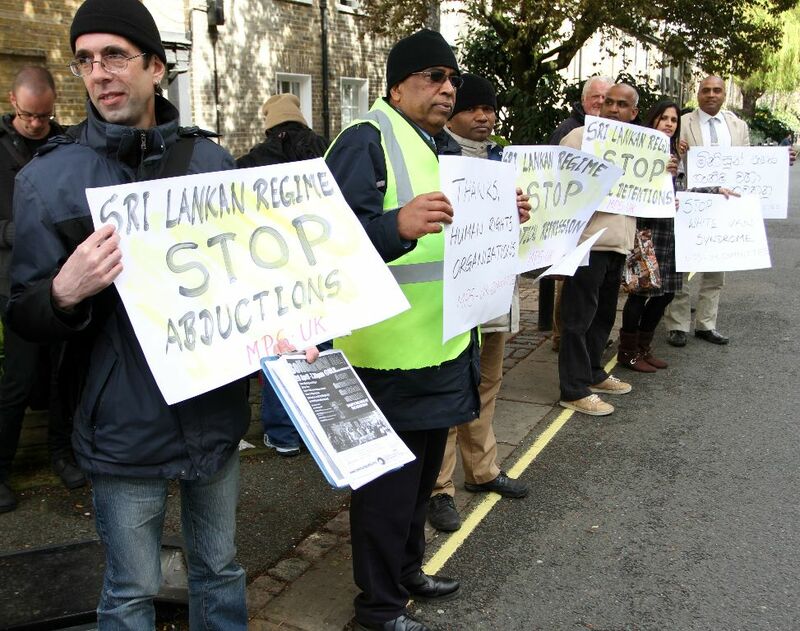 Around 50 people turned up in front of the Sri Lankan High Commission to express their anger against the on-going persecution of political activities by the regime. Those present chanted slogans such as: “end the white van democracy”, “release all political prisoners”, etc. Sinhala and Tamil-speaking people participated in the protest and expressed their unity against the current regime.